This is a book I had to read as part of a review exchange. It was on my “to read” list before that though because it sounded quirky and fun. It was, but it was also a lot deeper than I’d expected. This also is not the work I expected to be doing a post about today, but that one seems to have been taken down from everywhere, so it’s pointless to talk about. That’s a shame because then I would’ve gotten to tell the story of having someone argue with me when I left a five star review because I said the story wasn’t perfect. The lords of a dying planet send Piyat, a terrified “volunteer,” on a voyage across the universe. The reluctant alien crashes in the fear-washed landscape of Cold War America near the site of the nation’s first nuclear test. Captured by the Army and stolen by the CIA, she falls into the hands of a guilt-ridden ex-operative, a psychiatrist with a lust for pharmacology, and an Agency golden boy gone wrong. They turn her into the centerpiece of Project HALFSHEEP, a Top Secret program to test mind control drugs. But Piyat is not so easy to control. 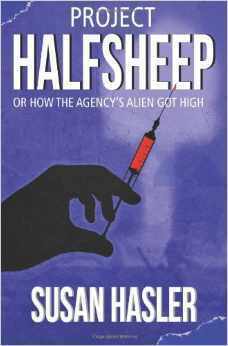 PROJECT HALFSHEEP is a darkly funny blend of science fiction and political satire informed by the real-life excesses of the CIA in its earliest years. I really loved the alien culture. It was relatable, but still, well, alien. I especially liked the differences — or were they? — between the high and low language, like a word meaning “adventurer” in one and “doomed” in the other, as well as little things like the alien finding 90 degree angles cramped. Well, that review is thorough enough that I don’t know what else I can say, except that I’m much pickier about science fiction than about any other genre — I assume because I write it, I really don’t know why though — so for me to give a science fiction novel five stars is a very rare thing.